It’s that time of year again: the leaves are turning colors, the air is cooling down (in some places, at least), and pumpkin flavored/scented products are taking over. 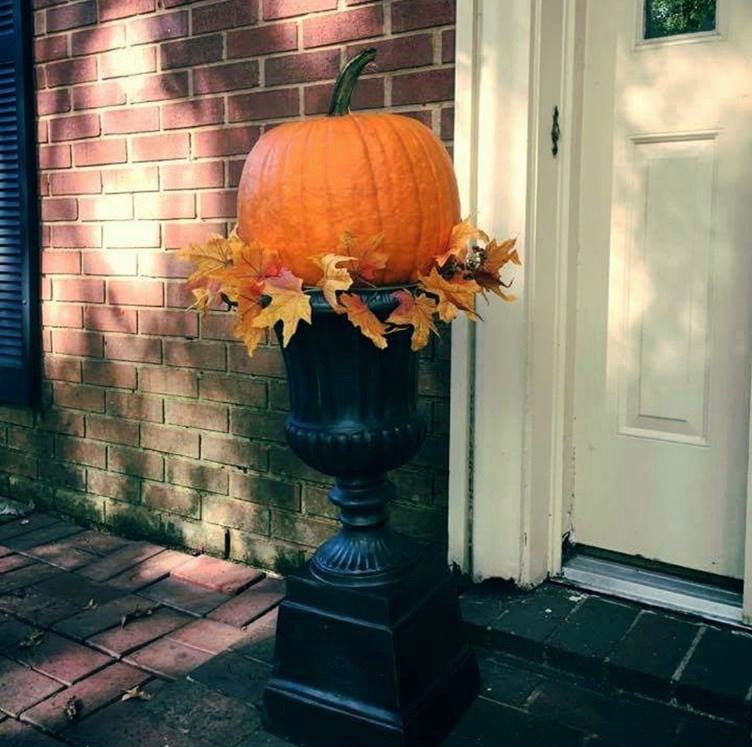 Growing up in Alabama, I always enjoyed (well, maybe not always) decorating for fall in late September/early October. Every year, my mom would get out the gourds, dried decorative corn, wreathes in orange, red, and yellow tones, and fall scented candles. It was always kind of exciting to mark the passing of summer to autumn, longing for days of cooler weather (if you’ve ever lived in Alabama, you know what I’m talking about). A week or so ago, I was chatting with my mom on the phone about how the weather was cooling down and all of the leaves here in Colorado were starting to change color. She told me that she had gotten pumpkins and fake fall-colored leaves to put out on the front porch of our house and sent me the above photo to show me how it looked. However, after seeing the photo, the notion of fall decor struck me as a bit puzzling. Why is it that we put out gourds and fake leaves every autumn? Coz I can tell you from years of raking that our house has plenty of leaves every fall! Why is it though that only certain types of leaves are the right kind of fall? Real leaves are often a bit of a nuisance — they’re raked up, stuffed in garbage bags, and left on the street to be picked up — , but fake leaves are hung on doors, placed in centerpieces, or used to accent pumpkins. What’s interesting, I think, is how in Alabama, we have come to caricature this notion of autumn. Maybe it’s from seeing photos of the leaves changing somewhere in the mountains and the ads of sweater-clad young-adults playing in leaves and sitting around campfires that contrast so sharply with the summer-like weather of Alabama? That cool, colorful, New England fall isn’t something I experienced growing up in the south, but we transitioned to fall all the same (despite wearing shorts and t-shirts well into November). Now that I live in Colorado, though, I don’t see the same outward show of transitioning to autumn like I once did. No doubt it happens, but it doesn’t seem quite as pervasive here. But, as opposed to the southeast US, we’ve had freezing temps already, the leaves on the trees are amazingly colorful, and everyone is donning their fall attire. There’s less need for decorative leaves and pumpkins on one’s front porch because it’s already there when you step out the door. I wonder whether New Englanders decorate for fall the way many in the south do? It certainly doesn’t seem to be the case in Colorado. With that in mind, perhaps these colorful leaves my mom got to go with the pumpkins aren’t that puzzling at all. In a place where the season change is considerably less noticeable, these hyperreal, caricatured, outward displays of seasonal changes, in fact, create the distinction that is more naturally occurring in other parts of the world. Of course, that is not to say that there is a right way to do autumn, but rather that we have come to construct seasons to look and be a certain way. So, when that construct doesn’t align with the climate of a particular region, we must then caricature it to create the sense of progression and distinction. That is to say that our concept of distinct seasons, while occurring in varying levels in different regions, is very much a product of our own construction. Now, I’m not saying, of course, that the seasons don’t change — they do, obviously. But rather, our concept of what that should be and look like, is itself very much constructed. And those notions produce these seasonal caricatures where our constructs don’t match our reality, thereby creating the season as we understand it to be. In this sense fake fall is — at least in Alabama — is more “Fall” than the one that occurs naturally. This entry was posted in Grad Blog, Relevance of Humanities, Religion in Culture and tagged Andie Alexander, Autumn, Classification, Distinction, Performance, Seasons by Andie Alexander. Bookmark the permalink.